Pineapples are infiltrating our schools! Stop me if you've heard this one before: an evil wizard has appeared and turned all the school children in Boston into pineapples. 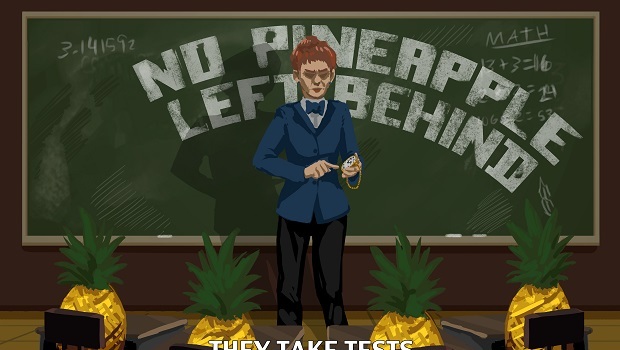 That's the idea behind No Pineapple Left Behind, a very weird game that looks to combine a business simulator with some rather out-there ideas. Turns out pineapples can still take tests and if they get good grades, they'll earn your school money. But there's a hitch, you see -- the pineapples are still children on the inside, and failing to take care of their needs will see them turn back into unruly, human pupils. Just like real life. The video above shows some really, really early alpha footage but you can see some of the core ideas displayed, like managing the individual teachers and pupils. The team at Subaltern Games are looking to release a playable alpha in a few months and I hope it turns out as weird as possible.